You’ll need to remove the husk from your tomatillos and rinse everything first. There’s a slightly sticky film left on the tomatillos. Some of it will wash off, but not all. That’s OK! Peel the onion and cut into quarters. 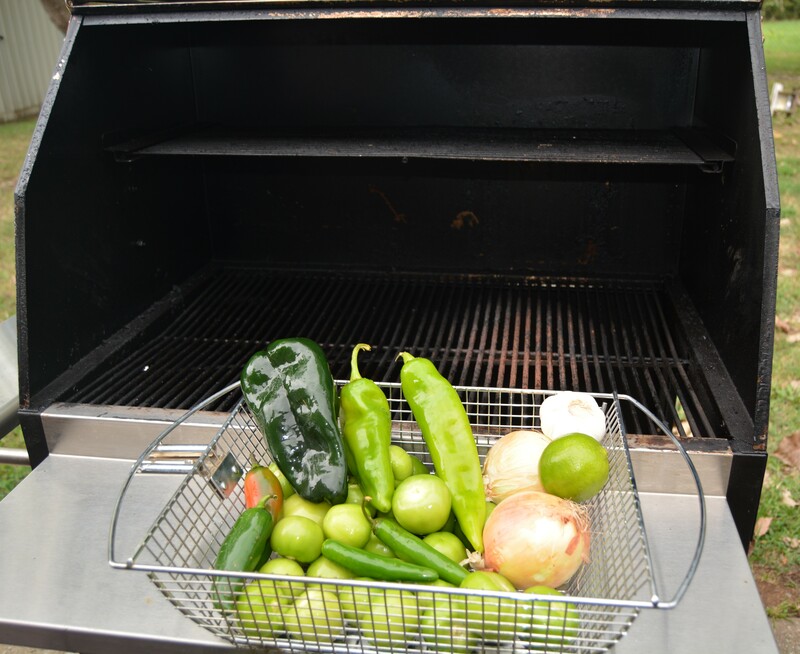 Once all of your vegetables are washed, you’re ready to fire up the smoker. 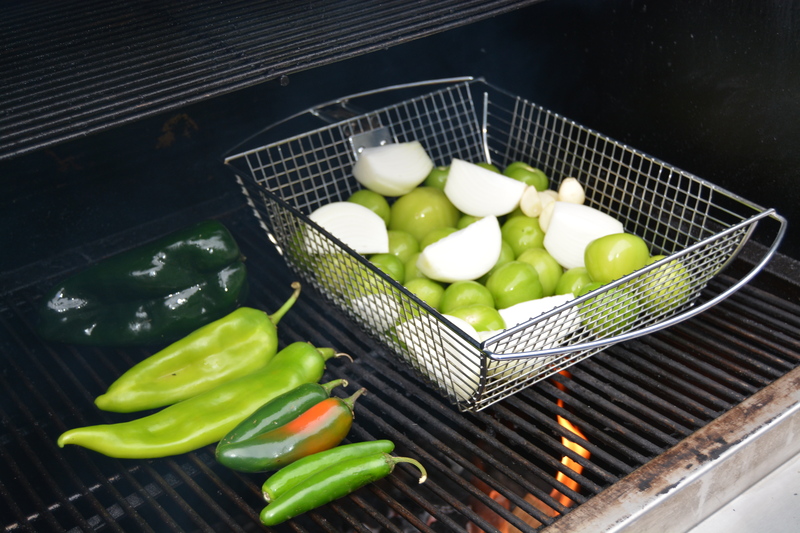 I started with the onion in the grill basket, but as you’ll see, decided to put them directly on the grill. I cooked these at about 350° for about 40 minutes. While the vegetables cooked, I added a couple of chunks of hickory to infuse some smoke flavor. I wanted the fire hot enough to get a char on the vegetables, but low enough to impart the smoke flavor into the vegetables. You can experiment with the temperature to impart more or less smoke. For a roasted salsa, don’t add wood to your fire. If you’re cooking on propane, just give the vegetables a nice char on all sides. 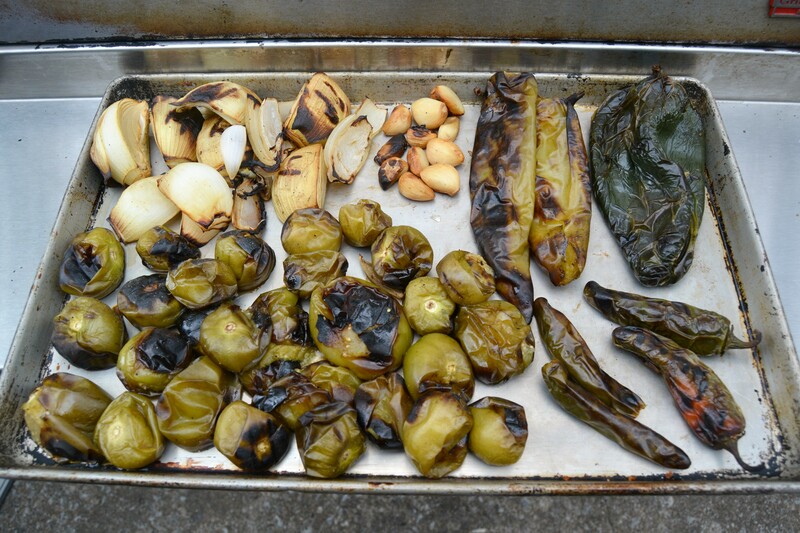 As the vegetables get a nice char on all sides, pull them off the grill and let them cool slightly. When the peppers come off, immediately put them in a gallon-size plastic resealable bag. This will help the skin separate from the meat of the pepper and make them easier to peel. Once everything has come off the smoker, it’s time to peel the peppers. Some peppers have a very waxy skin that won’t taste good in the salsa. In this recipe, the seranos, hatch, and jalapenos were pretty waxy and peeled easily. The pablano wasn’t quite as cooperative. Get as much as you can without driving yourself crazy! Once the peppers are peeled, remove the seeds and membrane inside the peppers. I removed them from all of the peppers and the salsa still had good heat. If you prefer a spicier salsa, you could certainly leave the seeds and membranes intact. It’s all about personal preference here. Now we’re ready to blend or… food process. In a blender or food processor, add all of the ingredients and blend until your desired consistency. Add water to thin the salsa if needed. When it all comes together, you can also add more salt, pepper, and other spices as needed. Refrigerate or serve warm. Enjoy! Cook over 350° grill until vegetables are slightly charred on all sides. Add smoking wood as need throughout the cook. Remove vegetables to cookie tray as they finish. Place peppers in a gallon-sized plastic resealable bag. Blend all ingredients in a blender or food processor to your desired consistency. Add water to thin if needed. Add salt, pepper, or other spices to taste. Serve warm or store in refrigerator. Enjoy! Thank you! 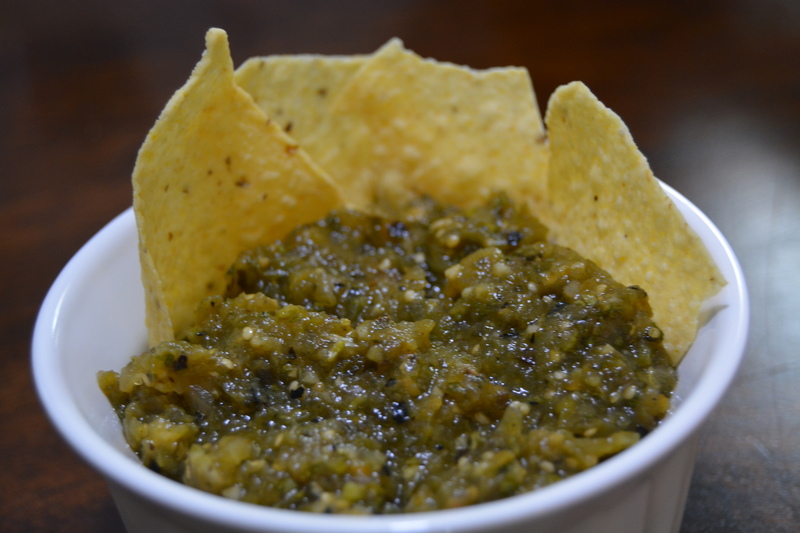 I didn’t think I would like tomatillos but your salsa was delicious.